One of the biggest mistakes made by many web teams is thinking about the web as a project. This mindset is the underlying reason why the overall quality of most websites deteriorates over time. Projects involve creating something new, and by definition have a beginning and an end. When web teams define their work as a series of projects, the live site is often ignored as other projects become a priority. The result is content that quickly goes out of date, the appearance of broken links, and the overall quality of the site begins to suffer and only gets addressed when things have gotten bad enough to warrant a full website redesign. There are several risks involved with thinking about the web as a project, all of which can lead to a poor user experience, a loss in revenue, lost clients – the list of negatives goes on. All it takes is one piece of inaccurate or outdated information for a visitor to question the credibility and reliability of all of the content on the site. Spelling and grammar matter, more than you think. Not only do these errors pose a reputational risk, they have a negative impact on search engine rankings. In addition, research has shown that 74% of consumers pay attention to the correctness of the prose on websites and 59% said they would avoid doing business with a company that has made obvious errors. Coming across broken links on a website can be extremely frustrating for a visitor and they also have a negative impact on search engine rankings. Many organizations create editorial style guides and web standards, but they are often not followed because there is no process in place to monitor compliance. Issues surrounding accessibility, copyright, and privacy are usually addressed during the initial creation of a site, but are often neglected once the site goes live, especially in distributed authoring environments. Since projects have an ending point, they don’t require a long-term, strategic plan. This is a challenge because the investment is not just for the initial creation of the website, but for ongoing maintenance and support. Very few organizations allocate the resources needed for the ongoing support of a website long term. So repeat after me - the web is not a project. The goal for any web team should be to improve the website over time, not let it fall into disrepair. Remember that once a site is launched, the real work begins. A website redesign is something that is usually thought of as a project instead of a process. 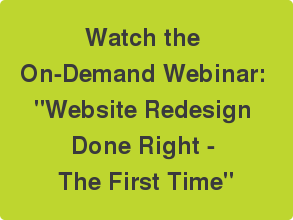 I'm hosting a webinar called "Website Redesign Done Right - The First Time" on Thursday, October 29. Register for the webinar to avoid these risks and learn how to think about your website redesign as a process for long-term website success. Receive bi-weekly updates on expert analytics tips, content creation hacks, accessibility news, and more. Request a demo of Siteimprove to start analysing, optimising, and protecting your website from one platform.